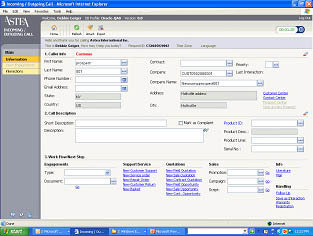 Astea Contact Center provides real-time access to a comprehensive view of all information required to support customers. Integrated, multi-channel inbound/outbound capabilities provide for unparalleled customer support, whether that means placing an order, updating records, making payments, receiving remote support, or scheduling a service call. Astea Contact Center provides real-time access to a comprehensive view of all information required to support customers. Integrated, multi-channel inbound/outbound capabilities provide for unparalleled customer support, whether that means placing an order, updating records, making payments, receiving remote support, or scheduling a service call. Call center staff can immediately take action on requests, increasing first-call resolution, decreasing call times and call center operating costs, and improving the customers’ experience for increased retention. Contact center personnel are empowered with visual alerts, automatic escalation, scripting and question trees, a full-range of corporate knowledge stores, and fingertip access to customer information, all at one point-of-entry. Information regarding customer-specific contract, warranty and service-level information, as well as up-to-date field service status, ensures a consistent customer experience. Work scheduling and demand balancing optimize staff utilization.